BikeWalkKC’s partnership with Hope Faith (formerly Hope Faith Ministries) began in 2016 with an Earn-A-Bike course. As a day center providing services for homeless and at-risk adults and children, Hope Faith’s goal was to offer their guests an opportunity to build riding skills and get basic bike maintenance training while earning their own bicycle. The six-week course was such a hit that Hope Faith began expanding their bike-related programming almost immediately. 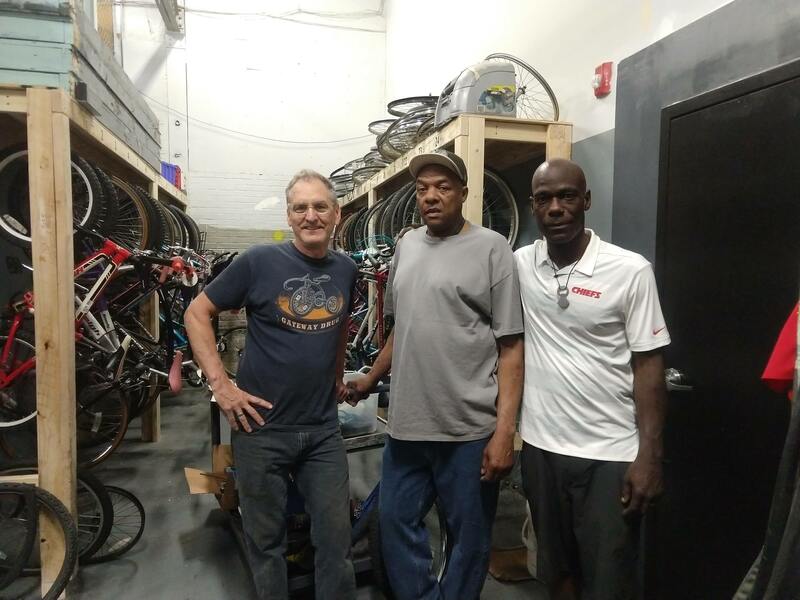 They found some space in an underutilized locker room and worked with our bike techs to build out a shop where guests could work on bikes for themselves and each other. Glen (R) of BWKC with Skittles (C) and Luther (R) of HOPE Cycles. 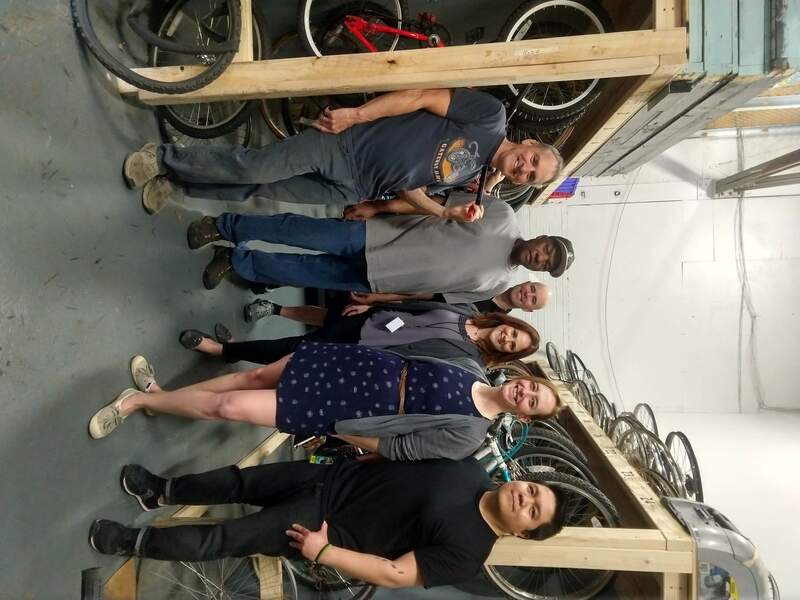 The mechanics at HOPE Cycles (formerly Hope Faith Bike+Works) have completed apprenticeships with BikeWalkKC mechanics in our shop. The first program graduate, Kevin Colbert, started with us in February 2017. After he completed his training, Kevin could often be found at HOPE Cycles, surrounded by kids soaking in the intricacies of derailleur adjustments. Our second apprentice, Skittles, is overseeing the HOPE Cycles shop now, and he and Alfredo are planning to send a new apprentice to BikeWalkKC soon. BWKC and Hope Faith are teaming up to expand the HOPE Cycles bike shop. In addition to bike shop help and programming, Hope Faith partners with BikeWalkKC and RideKC Bike to offer Bike Share for All to their guests. Bike Share for All ensures that those who rely on needs-based services can access annual bike share memberships for $10. Bike Share for All members can also use pre-paid credit or debit cards if they do not have a bank account. BikeWalkKC is honored to work with an organization so committed to strengthening our community, and we are always looking forward to the next step, whether that’s an apprentice mechanic, an education program, or a neighborhood bike shop. BikeWalkKC members power our work. Find out more about how you can support partnerships like this one when you Join the Movement. Posted in BikeWalkKC News, KCMO Central-South, Local, News.